River City Art Association members Todd Stokes, Sheila K. Ter Meer and Spencer Young have artwork in the “Abstract, Multi-Media, and Collage” exhibit featured in August in the Sullivan Area Art Guild Gallery at 16 S. Court St. in Sullivan, Indiana. The show opened Aug. 2 and will close on Aug. 25. A reception is set for 1 to 3 p.m. Aug. 12 with a 2 p.m. program on abstract art by Edie Dyer-Wilson. 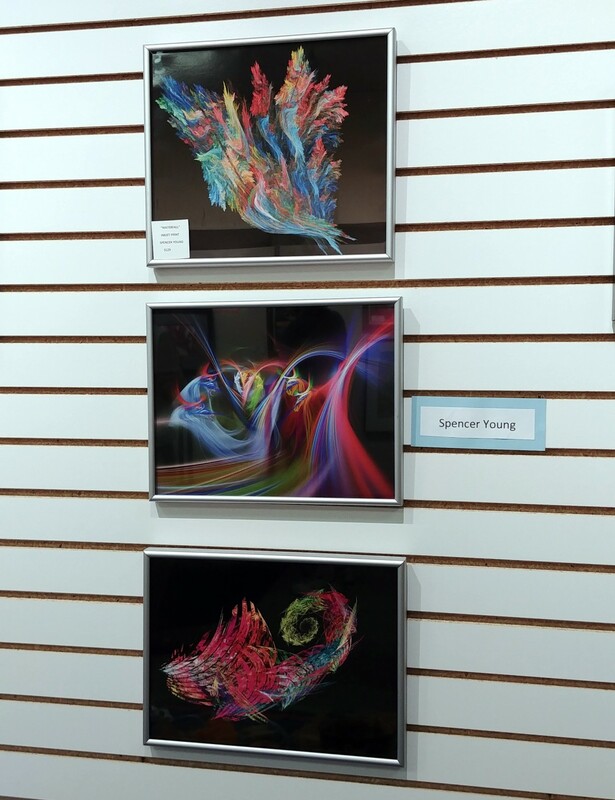 Several of Young’s fractal flames were featured in a 2016 exhibit in the math department at Rose-Hulman Institute of Technology in Terre Haute. Ter Meer, a resident of Brazil, Indiana, has entered “Apache,” a photography based digital art abstraction. The lustre image face-mounted to acrylic was selected in 2016 for the Second Annual Juried Exhibition at Arts Illiana Gallery in Terre Haute. She has two other abstract pieces in the exhibit. Stokes, of Terre Haute and Dennison, Ill., has three etched glass pieces in the exhibit, including “Status Quo,” which was on display in Juried Exhibition 2018 in Arts Illiana Gallery. Admission to the Sullivan gallery is free. Many of the art items are for sale. The guild opened the gallery in March 2013 to show works by members as well as regional guest artists. The gallery also offers art classes for children and adults. For more details, contact Kat at 812-236-9773. This entry was posted in Gallery Feature, Member News and tagged abstract, abstraction, algorithm, algorithm software, Art, Arts Illiana Gallery, collage, digital art abstraction, etched glass, fractal flames, math, photography, River City Art Association, Rose-Hulman Institute of Technology, Status Quo, Sullivan Area Art Guild, Terre Haute Indiana, waterfall. Bookmark the permalink.